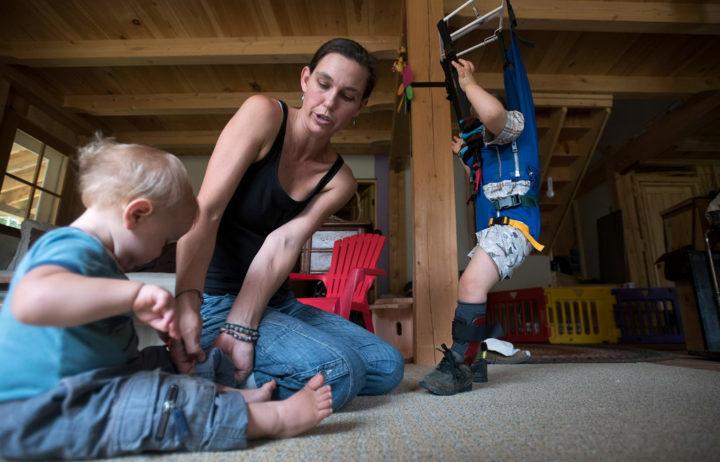 Andrea Dole, 37, helps her son three-year-old James to keep his balance at their Swanville home. James was born with microcephaly, a very rare congenital birth defect, has a significantly smaller head than other children his age and is often the cause of developmental issues. On a warm summer day three years ago, Andrea Dole gave birth at home to her first child, James, with the support of her partner, Patrick Dole, and under the care of two midwives and a doula. The midwives noticed something the new parents didn’t, though: Baby James’ head was very small, indicating something was wrong. An ambulance arrived at the small homestead farm where they were living at the time, and the sad way the emergency responders looked at Andrea and Patrick Dole spoke volumes. 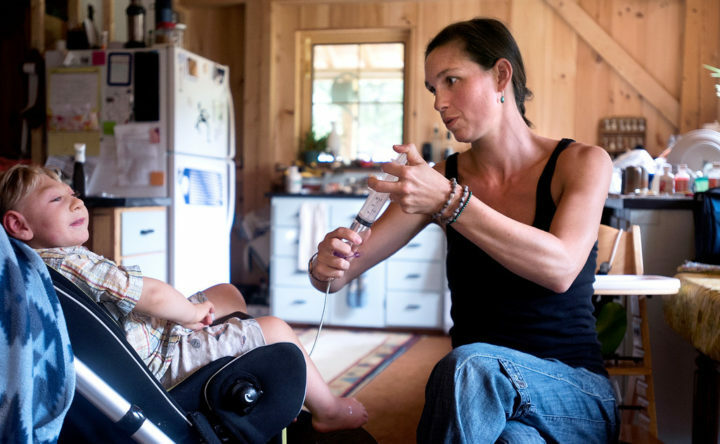 Andrea Dole, 37, gives her son, three-year-old James a drink of water through a G-tube at their home in Swanville. James, who was born with microcephaly has a hard time swallowing, and now eats and drinks via a G-tube, or gastrostomy tube, which is inserted through his abdomen in order to get food directly into his stomach. James was born with microcephaly, a rare neurological condition, in which a person’s brain doesn’t develop completely in the womb. It’s linked with seizures, developmental delay, intellectual disabilities and more. Soon the Doles saw their tiny newborn taken first to Waldo County General Hospital in Belfast and then to Eastern Maine Medical Center in Bangor, where he was quickly hooked up to machines and monitors. The memory of that first, peaceful hour at home with their baby helped sustain Andrea and Patrick Dole, 34, through the hard days ahead. But the bad news kept coming. In addition to microcephaly, James was diagnosed with another rare condition called lissencephaly, which means that his brain did not develop with normal folds and wrinkles, but is smooth. This can have a serious effect on a child’s neural functioning, and children with severe lissencephaly have a shortened life expectancy. Doctors told the Doles their son had only a couple of weeks to live. One even told them that he was “like a chimpanzee. He’d never feel pain,” Patrick Dole recalled. 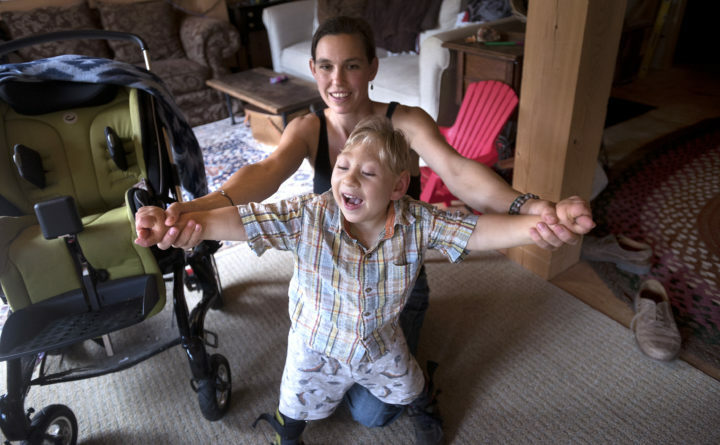 Andrea Dole, 37, tends to 11-month-old Rafe while her older son, three-year-old James spends some time in his therapeutic jumper at their home in Swanville. James was born with microcephaly, a very rare congenital birth defect, has a significantly smaller head than other children his age and is often the cause of developmental issues. Andrea and her husband, Patrick Dole, live in an off-grid home they built. James was brought to a hospital in Portland, where he was seen by neurologists, geneticists, palliative care experts and social workers, and continued to be hooked up to machines and beeping monitors. “We couldn’t even pick him up,” Patrick Dole said. Finally, his parents hit their limit. They consulted with the medical staff, and because James had started to take a bottle and even nurse, they were given the OK to unhook their baby and bring him home. All the doctors said that they should prepare for him to die. That’s not to say that the family’s story just ends there, on a triumphant, heartwarming note. Their tiny newborn has grown into a giggling, bright-eyed 3-year-old who is defeating his dire medical prognosis, but he can’t walk or talk, and caring for him is more than a full-time job. His future is uncertain at best and bleak at worst, and every day Andrea and Patrick Dole understand that his life will never unfold the way they had imagined it would before he was born. For the family, caring for James means taking a hard left turn from the path they had been on, and trying their best to make a new map for the future. What happens when the best-laid plans and expectations get turned upside down? Nothing that is easy, they said. 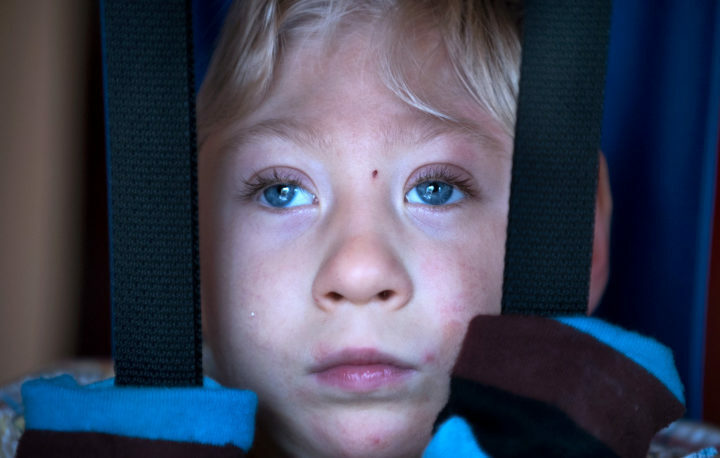 11-moth-old Rafe Dole often plays around his brother, three-year-old James, while he spends time in his therapeutic jumper at their home in Swanville. James was born with microcephaly, a very rare congenital birth defect, has a significantly smaller head than other children his age and is often the cause of developmental issues. Andrea and her husband Patrick Dole, live in an off-grid home they built. Before James, Andrea Dole, a social worker, and Patrick Dole, a boatbuilder, knew they wanted to build their own home on a piece of wooded land Patrick had bought before he even met Andrea. Patrick grew up in the suburbs of New Jersey and always had wanted to live in the woods. “I don’t know what other people dream about, but I dream about building my own house,” he said. The couple share a deep commitment to a sustainable, simple lifestyle, and are the kind of independent Mainers who want to do it themselves. 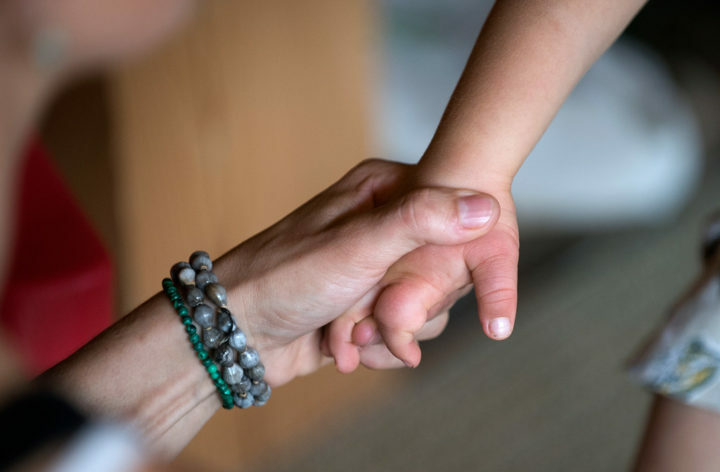 That attitude didn’t always work well after James was born, Andrea said, adding that it truly took a village to care for him, including a network of therapists and providers. They couldn’t have done it alone. Patrick Dole agreed, saying that in some ways he feels it was a blessing that James was their first child. James’ diagnosis came as a surprise to everyone. Microcephaly can be caused by a variety of reasons, including genetic abnormalities, exposure to certain viruses or severe malnutrition during pregnancy. It can be of varying severity, and happens between two and 12 babies per 10,000, according to the U.S. Centers for Disease Control and Prevention. It also made headlines three years ago, after a Zika virus epidemic in Brazil was linked to microcephaly in infants. At that time, the CDC became particularly interested in babies born with microcephaly. When James was 9 months old, health officials did genetic testing of the Doles to find out if they could understand why it had happened. They learned that both Andrea and Patrick Dole were carriers of a recessive gene that caused James’ microcephaly. Having that knowledge was hard, Andrea Dole said, but also provided her with some answers. Andrea Dole, 37, helps her son three-year-old James to keep his ballance at their Swanville home. James was born with microcephaly, a very rare congenital birth defect, has a significantly smaller head than other children his age and is often the cause of developmental issues. “Knowing that James had this from the very first time his cells divided in the womb — that gave me peace of mind,” she said. And that was something that was in short supply back then. It was at a time when the family was living in a camper while Patrick was starting to build their off-the-grid post-and-beam house on the outskirts of Belfast. The baby had a hard time swallowing, which is not uncommon with children with microcephaly, and Andrea was spending hours each day trying to feed him. “It was a very stressful daily existence,” she said. These days, daily life looks and feels a lot less stressful and more sane, even with the addition of another child. 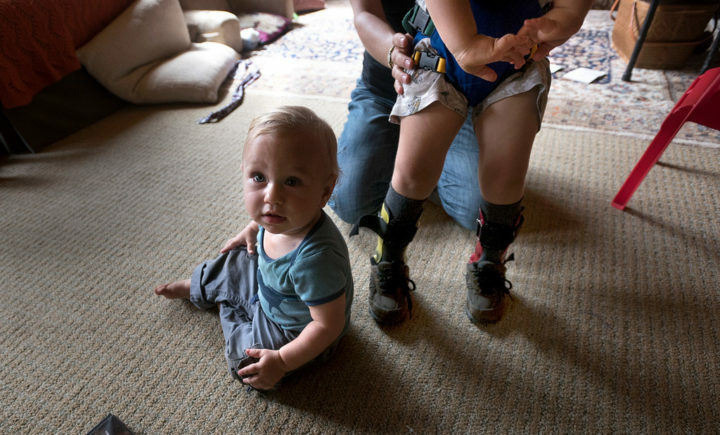 Rafe, their second son, is a busy, active almost 1-year-old who does not have microcephaly. The family has moved into the new house and about a year and a half ago made the very difficult decision to have James undergo a surgery to insert a gastronomy tube, or G-tube, directly into his abdomen so he can be fed that way. But once the surgery was done, it took minutes to feed James instead of hours. Suddenly, Andrea had time and energy to do other things with him, too, including taking him for long sled rides through the winter woods. The Doles have worked to get James the help he needs, including seeing a physical therapist in New Jersey who is an expert in the field. Their team includes therapists, developmental educators, case managers, physical therapists and neurologists, and they have day and night nurses in the house to assist him. Having the outside support has been a positive turning point for the whole family, Patrick Dole said, adding that they are currently looking for a couple of new nurses to help. One nurse, Sylvia Grover, who was with James on a recent day, said that she has seen him improve over the weeks and months. James goes to Waldo County General Hospital in Belfast for pediatric occupational and physical therapy. He also spends a lot of time at home in his therapeutic jumper, which his parents were able to buy with the help of their family and friends after he outgrew his Jolly Jumper about a year ago. Soon, he’ll be heading off to an inclusive preschool, where he will spend time with all kinds of other kids. And he’s continuing to beat expectations, his parents said. James Dole spends some time in his therapeutic jumper every day. James was born with microcephaly, a very rare congenital birth defect, has a significantly smaller head than other children his age and is often the cause of developmental issues. His partents, Andrea and Patrick Dole live in an off-grid home they built. The Doles want to talk about their journey with James in part because when they first learned about his diagnosis, they had a hard time finding more hopeful narratives of life with microcephaly. They did find other families via Facebook support pages and by networking through local therapists, and it helped a lot. “I would really like for new parents faced with a challenge and a challenging diagnosis to feel empowered,” Andrea Dole said. Parenting James, they have found, means being engaged with every aspect of his life. In order for him to be active, they have to interact with him. There is no chance they could drop him at the playground and just zone out with technology while he’s playing, for example. But that kind of intentionality is familiar to them. At their house, they don’t spend a lot of time on computers or watching television but strive to be engaged in their lives, especially the parts that look like work. Like chopping wood or building a house or preserving this summer’s tomatoes for a winter feast. They want to do that even with an active almost-toddler and a 3-year-old with special needs and an unknowable future.